Babies are all adorable – that’s a given, but have you ever considered the haircuts that would be suitable for baby boys? A cute hairstyle to complement the baby’s cute appearance would be just the right addition! In case you are out of ideas for cute haircuts for baby boys, we have compiled a neat little list just for you! We believe that good hairstyles should be available for people of all ages – even babies and toddlers. Baby boys should not be left out when it comes to getting the cutest hairstyles possible. 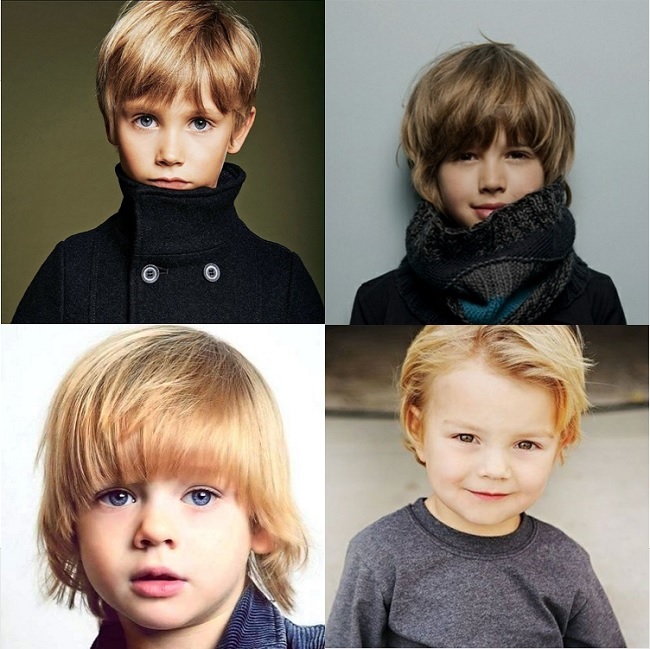 Just keep reading to find out what other baby boy hairstyles you can opt for your precious baby boy! A bowl cut is a hairstyle that most children will have at some point in their childhood. This is especially true for babies and toddlers with thick hair! When you cut a baby’s hair to an equal length from all sides, you will have yourself a bowl cut on your baby boy. However, due to the child’s hair thickness, the hair will form a mushroom-like shape, or look similar to a bowl, earning this baby boy haircut its nickname. Create a patterned undercut hairstyle for your little boy by contrasting the lengthy hair at the top with a trimmed side and/or back. You can create a patterned undercut like in the photo above by varying the lengths of hair at the side too! Undercuts are a creative component that can be added to plain hairstyles to make them much more interesting and attractive. Imagine the attention on your little boy will be getting with this baby boy haircut! A popular hairstyle among teenagers and grown-up men, baby boys can also rock little buns on their head! This stylish, hipster-look can be worn by baby boys with medium to long hair length. With sufficient length of hair growing on the back of their heads, you can tie a small, slightly- messy bun and pair it up with plain colored shirts and pants to create the perfect, cool baby look! Neat combovers are the way to go if you want your baby boy to have a less naughty look. These baby boy haircuts will make them look like professional baby businessmen! Depending on your baby boy’s hair texture, hair gel could be needed to give them the best look that they can have. You can apply hair gel to your baby boy’s hair and comb it upwards to enhance the combover. Cornrows are super flexible, with plenty of possibilities when it comes to styling them. You can decide how far apart one braid is from the other, or if the braids are going to be done along the scalp. You can also decide if you want the braids to be plain and simple, going from the front of your baby boy’s head to the back. If you don’t, you can create braids from the sides of your boy’s head and style them in a certain pattern. This is mostly seen on black kids hair.This will certainly require a lot of planning and some length of hair to work with! Baby boys blessed with naturally curly hair barely need to style their hair! You can just grow his hair out to a comfortable, manageable length to start, or you can style it with fades along the side. Grow the curls out a little longer and you might have yourself loose curls that dangle over your baby boy’s face. This is an easy baby boy hairstyle to maintain. Parents that want their kids to look stylish since young can add the fade factor into their hairstyles. Whatever the hairdo – a simple short crop, spiked up or a combover with a razor line cut, you can always add a fade to the sides to make the hairstyle look cool immediately. Faux hawks are cute hairstyles for baby boys who are super active and stylish! When you see these hairstyles, you mind easily imagines these boys running across the football fields, playing in the playground and more. While this isn’t a natural hairstyle, you can definitely create faux hawks with just a little bit of hair gel with ease. Its simplicity makes it a good hairstyle choice for little boys! Who said baby boys can’t look glamorous and cover page-worthy? All you need for your little boy is to grow him a fringe. Fringes can be styled just as easily as other hairstyles – you can comb them neatly downwards, or you can comb it upwards to give the young boy a more carefree appearance. Take your pick! Young boys with an afro hair texture can definitely take this baby boy haircut as their top pick for their hairstyles. It looks cool and fancy, just as it does even for older adults! The clean lines and the high top fades along the sides accentuates the thick afro on the top. A good choice for little boys who want to focus on their thick hair! Here’s another option when it comes to adorable haircuts for baby boys. If your hair is thick enough, you can cut the hair in different lengths to give your little boy a layered look on his hair. This haircut will often result in a fluffy appearance, enhancing your little boy’s cuteness by leaps and bounds. Think about the contrast between black and white – that’s what razor lines do! As the name suggests, a line is cut through the hair parting area to accentuate the hairdo. You can also create more line-focused hairstyles using the clean cuts around the edges – just above the forehead, next to the hairline, so on and so forth. 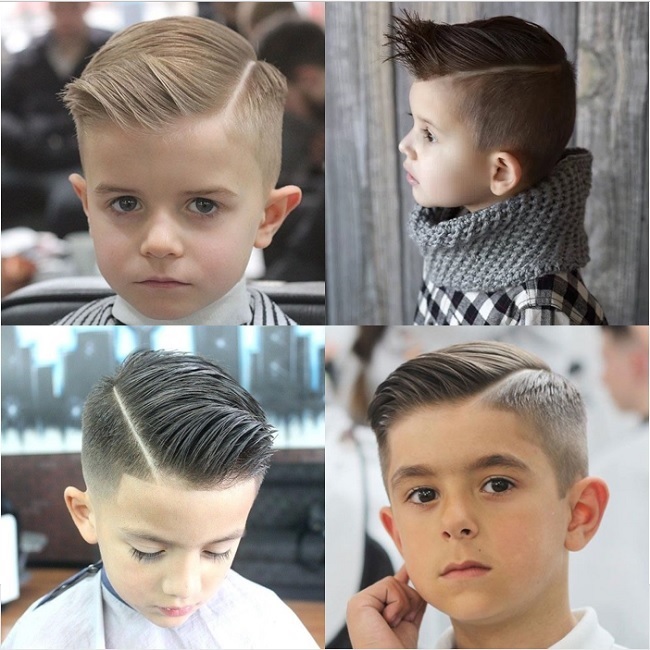 These clean baby boy haircuts will bring all the attention to how sharp your hairstyle is! Here’s another baby boy hairstyle that you can adapt for your curly-haired baby boy. When you leave his hair to grow naturally like this, you will find him with a head of loose, wild curls that is suitable for most boys! After all, aren’t little boys all wild and playful? The curls that drape across their foreheads just enhance their cuteness! This definitely needs to go into the list of baby boys’ cute hairstyles. It requires little to no effort – just grow the baby’s hair out and see how it comes to be! Some babies have such a thick head of hair that long hair just makes them look like little lions, while some others with thinner hair can use it to their advantage by using stylish hairdos. The possibilities are limitless! If you thought that baby boys cannot rock little Mohawks, you are wrong! These baby boys above absolute rock their neat hairdos – shaved at the sides and spiked up the middle. A little hair gel can go a long way, although you won’t want to go overboard to protect these little boys’ hair quality. Even when no hair gel is used, little boys will still look good in that hairstyle, provided their Mohawks are not too long. If you want a creative haircut for your baby boy, you can opt for these striking cuts! 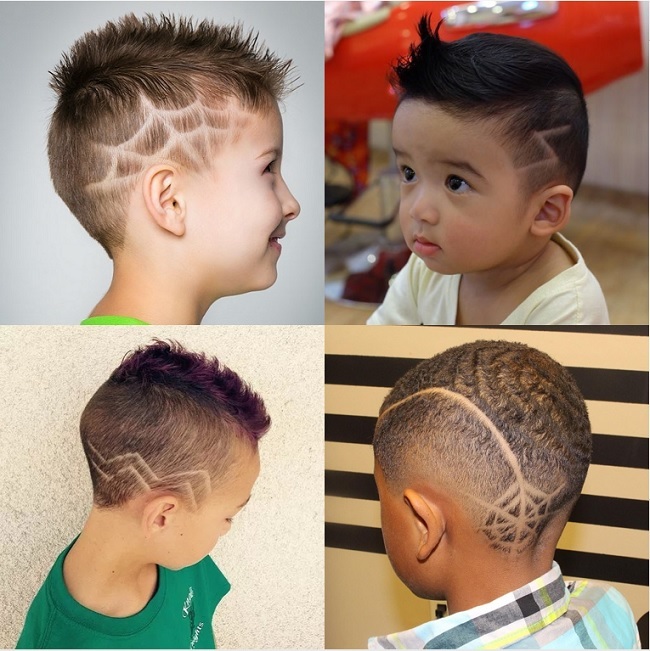 Little boys with short hair can embed patterns into their hairstyle by shaving off just thin lines in the desired patterns. It can be something as simple as a zig-zag line or as complex as a spider web pattern and much more! You might need some effort finding a hairdresser that is skilled enough to create these patterns like this, however. A cute yet trendy style for baby boys with thick hair would be a pompadour. The hair at the sides may be short or even completely shaved, but the thick hair at the will be combed upwards and into the middle, creating a puffy appearance. The thicker the hair your little boy has, the easier and more natural this pompadour will look! We consider this a super cool and stylish hairstyle for little boys. If your little boy has already grown a fringe, then all you need to do is to comb it towards the side. Even if he doesn’t have one, you can wait it out a little until his hair is just long enough, and comb it over! A business-like haircut can be defined in so many ways – but there’s one common point that we are looking at here. It looks super smart! This look can be easily achieved with a short haircut, a simple ruffled look, and an awesome outfit. Semi-casuals or smart casual outfits would fit right in with this haircut on your baby boy! Plain Mohawks too common for you? Use some hair dye on it to make it really stand out! Hair dyes could be a little too permanent for some parents’ liking, so you can consider applying non-toxic paint or skin-safe dyes on the Mohawk so that it is easily washed off with a shower. Get creative and use thematic colors to match your boy’s Mohawk color with an event – such as your country’s national day! If you want to put the focus on your little boy’s hair and nowhere else, dyed hair is the way to go for you. The brighter the color, the more attention it would get from the public, so you can try out colors such as aqua blue, light green or even yellow and red if you are bold enough! Do keep in mind that children’s scalps are quite sensitive to chemicals in hair dye, so it would be good to look for a gentler hair dye type. Alternatively, you can apply the hair dye a little further from the scalp so that it affects only the hair and does not get into your boy’s skin. Even little boys can look all business-like with a classy side part. This may not be considered a cute hairstyle for baby boys, but you can be sure that it is a really handsome one! Line-ups along the edges of your baby boy haircut will be a big advantage to the haircut’s overall looks – adding more edge to the look. Secure your boy’s side part with a little hair gel! A spiky haircut is one that even little baby boys can wear. Babies with a minimal amount of hair can have their hair coaxed into a small spike even without any additional items or materials – and they look super cute with it! Give this universal look to your little boy if you are unable to make a decision on the hairstyle that you want. You can be sure that it will never go wrong! Does your baby boy have a thin head of hair? No worries! You can give them an appearance of thicker hair just by combing it upwards, creating a little spike or keeping the focus point on the center. The key is to divert the attention away from the thin sides, and create another focal point instead! Try not to dampen the hair any more than it is to avoid a flattened, matted down appearance – it will make the hair look even thinner! Baby boys typically have short hair, unless we are talking about babies more than 2 or 3 years old when they would have grown out more hair. For baby boys with short hair, you can tie up some short braids for them. These braids can be styled in many ways, depending on how you are tying them up in the first place. Get creative and see how you can style your toddler’s! See? There are plenty of hairstyles that you can choose for your baby boy! Just ensure that you are selecting the best baby boy haircuts or look that can complement your baby boy’s hair texture, thickness, and length for best results. While it may be difficult to voice out what hairstyle you want for your baby boy, a picture will usually do the trick at the hairdressers. Follow our page for other similar articles!